If you’re looking to lose weight and keep it off forever with plant-based foods, I can help. a) want to lose weight and not put it back on again. The GOOD NEWS is there is no wrong answer! If any or all of the above apply, you’re in the right place. I’m Coral Sirett and it’s my goal to help you lose weight and keep it off forever so you can stop thinking ‘I have to go on a diet’ and to feel in control again. I work with clients who are fed up yo-yo dieting and want to learn how to feel confident, wear the clothes they love and take control of their relationship with food. When you work with me you’re not alone, I will be with you every step of the way. Obesity is a global health crisis and I am sure you have heard a lot about the health issues relating to people being overweight. What is so often overlooked is why this is happening and what can be done about it. Fingers are pointed at sugary drinks and cereals, take-aways, people eating on the go, the fact that people lead such sedentary lives now. With certain lifestyles come certain habits and sometimes it’s only when we need the next size up when clothes shopping or see a photo, that we realise the weight has crept on. Our very busy lives can often mean that doing something about our weight doesn’t take priority, until it starts to cause issues with our health. In England nearly 2/3 of adults are classed as overweight or obese and the estimated cost to the NHS of treating overweight and obesity-related ill-health in 2014 to 2015 was £6.1 billion. I think that money could be spent on so many other things, rather than something that is largely preventable through lifestyle changes. Of course, knowing what to do and actually doing it are two very different things. Some people also feel so confused with all the conflicting information out there that they don’t know what to do. It can also be very confusing. That’s where I come in. I truly believe that with the right support and mindset, accompanied by clear actionable steps, you can achieve your goals. I’m obsessed by all things nutrition and plant-based, building up my knowledge over more than 10 years, investing in an Advanced Diploma in Nutrition and Weight Management and a plant-based certificate course with eCornell University in New York. I have been interviewed for UK Health Radio, talking about how to transition to a healthy vegan diet and how to use a plant-based diet for weight loss. You can check out my latest interview by clicking on the image below. For many years I helped friends and family with questions about food and health and decided to build an online business to help as many people as possible. After different careers in the textile industry and in the charity sector I have realised this is what I was meant to do. This is what I am passionate about and what I truly believe in. Nothing beats helping someone who may have struggled with their weight for decades develop into someone who believes in themselves again and knows they can do it with my help and support. So, while I’m a big fan of nutrition and all things plant-based my approach is all about YOU! Your health, your successful weight loss and your happiness! I work with clients on proven strategies to take control of what they’re eating, becoming more active and enjoying life again. We discuss the changes you feel you can make and take them a step at a time. …I love the outdoors, especially on the rare days of sunshine we get in the UK! Walking, cycling and running make me feel so good. Would you like to start eating healthier, making food from scratch, but without spending hours in the kitchen? 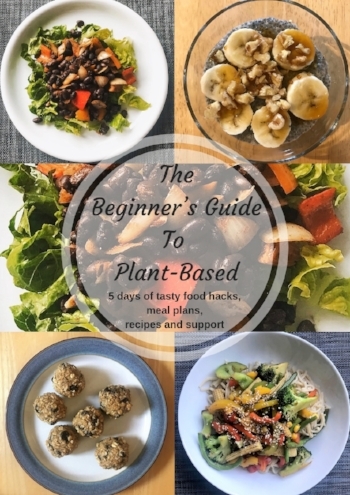 All you need to do to get started is CLICK HERE to receive my FREE 36 Quick & Easy Plant-Based Recipes book. With snack ideas and recipes, including desserts, there’s sure to be something you’ll love and will want to make again and again! I would struggle to pick a favourite but I do love the Overnight Cinnamon Raisin Oats. All the recipes are either gluten-free or can easily be amended so that they are. Grab your copy of my 36 Quick & Easy Plant-Based Recipes book here. Let me know which one is your favourite. I’m really looking forward to hearing what you think.